November is here and with it brings a challenge for me. Can I do it? Is NaNoWriMo still a thing? Or was that just for novels? Somewhere along the way I lost my blogging mojo, but I realized recently that I missed writing. I think it has to do with the kiddos growing up and their desire not to have me write about every little moment. I definitely has to do with work and life getting in the way. Let’s pave the way for the BeachMama 2.0. I am still and will always be BeachMama, however, with our move to the Farmhouse I have also become something in between. I have found that country living is a really good thing. With our neighbours being so much farther away from us, not so far that you can’t see them just far enough that you rarely hear them or interfere in each others lives, our lives have become so much simpler. I have become much simpler. I have found my love of baking again, making jams and jellies, canning and sitting on the front porch with a glass of lemonade or wine, depending on the day. Rural living is not for the faint of heart. Going for a long walk requires carefully walking along part of the old highway in front of our house. No more quick walks to the store or the coffee shop. The kiddos take buses to school and we don’t have public transportation, which means we drive a bit more. On the other hand we don’t deal with much traffic so our drives are more enjoyable and we knew what we were getting into living out here. It also means we can get snowed in and when the power goes out so does our well pump so we have no water, thankfully it has only happened a couple of times in our three and a half years here. The bonus for living out here are the beautiful, unobstructed sunrises. No matter if we see it every day, each new one is a gift, the sunsets are also unbelievable and a great reminder that each day comes full circle. The views are spectacular and depending on the time of year, it is always different. If there is corn in the fields, they start small and green, then grow tall, move on to a golden colour and make lots of noise in the wind. Wheat was the most beautiful, swaying in the wind, it was like watching water flowing in a river. Soy is lovely, changing from green to gold. As November brings the colder weather and possibility of snow, I will do my best to reintroduce you to myself and see if I can find my blogging mojo somewhere in there. Not long before moving from the suburbs to the country, our wee little Apple started talking about horseback riding. We held her off for a while as we didn’t even know where to begin with it, let alone the fact that I am (was) deathly allergic to horses. But since then, our equestrian has been born. Once we made the move it was pretty hard to keep her away. Not only do our neighbours own a horse barn and we can see the horses out in the paddock from our front porch, but we are less than a kilometre from some amazing stables, Stratford-Fox Run. We first heard of them from a couple of teachers at our old school who board their horses there. So, we got in touch with them and started Apple off with a summer camp, to see if she even was able to ride. From the first day she has wanted to live at the stables. From camp we went to lessons and now only a year and a half later, she is doing some in-house equestrian shows. We feel/fear her love of riding and jumping will take us to some shows out of house, but we are hoping to hold off on that for at least another year. 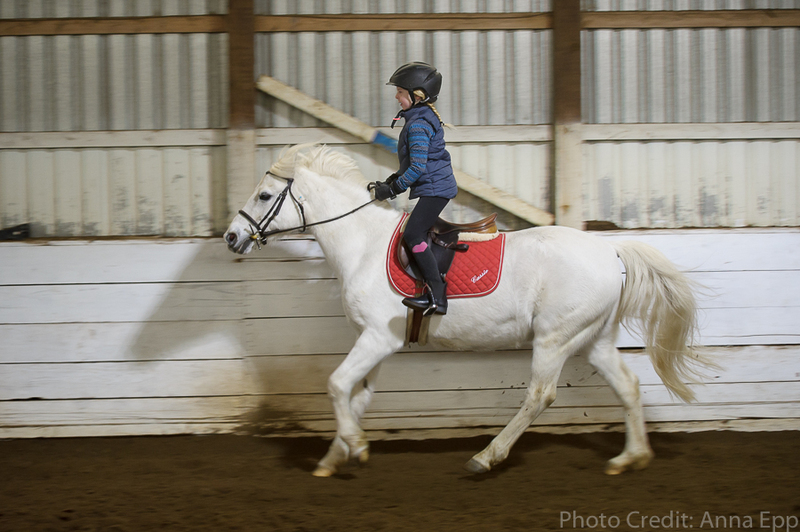 In school she has to do a project on fitness and when she first told her teacher she was going to be showcasing horseback riding, there was some question as to how much fitness was involved. Apple was quite convincing and explained to her teacher how there is stretching and posture and muscles used to stay on the horse involved. She was giving the go ahead and I was asked to capture her riding for her project. 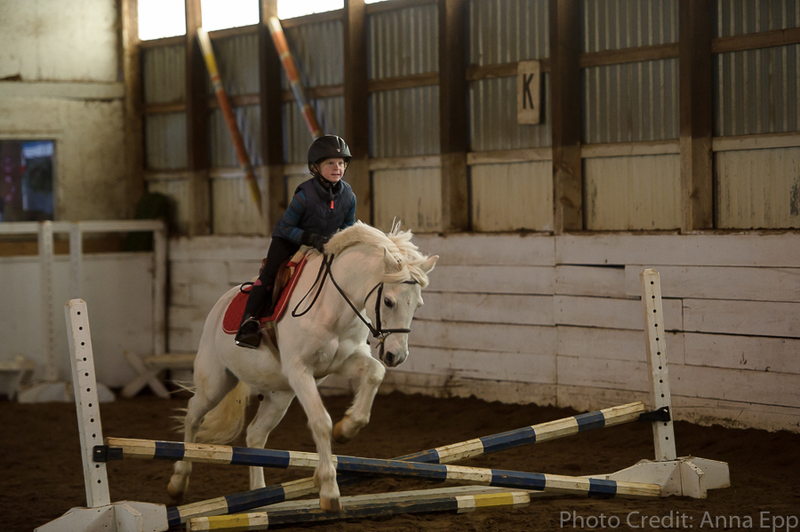 As I don’t often shoot in horse arena’s there is a learning curve for sure. In the winter they aren’t as bright, adding to that it was quite a cloudy day. So, I think, not so bad for a first try and now I know what to do for next time, as I am sure there will be a next time. And needless to say watching her ride so closely, I can see how much work it takes for both horse (this is actually a pony that Apple is riding) and rider to accomplish. We are definitely proud parents and on the good side, the more time I spend at the barns, the less my allergies act up. And because we can’t ignore this handsome fella, meet Chubbs. He came sauntering over to see us after lessons were done. 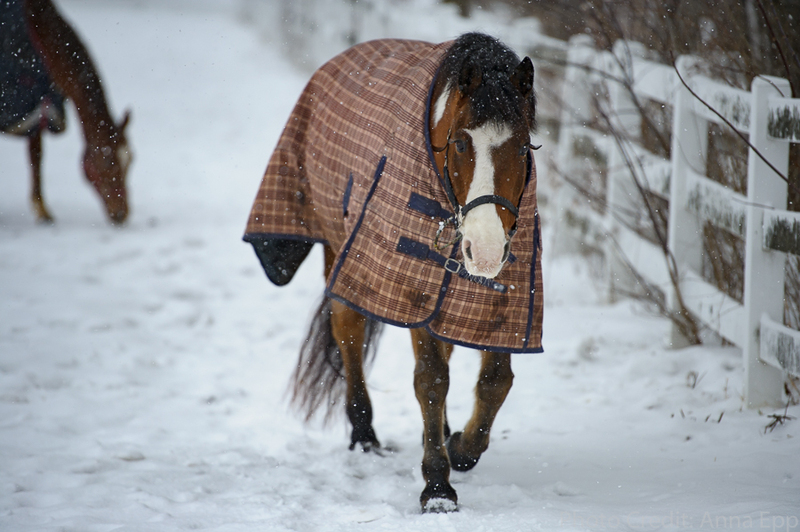 Nothing like a frolic in the snow for this guy. As winter finally arrives and the temperatures, ironically, warm up, we were blessed with a rather large and beautiful snowfall. As much as I am not a lover of winter, I figured it out a few years ago. If you can’t beat ’em join ’em. I embraced winter as best as I knew how. I dress warm, wear my hat and scarves, snow pants, boots, whatever it takes to make being outside bearable. 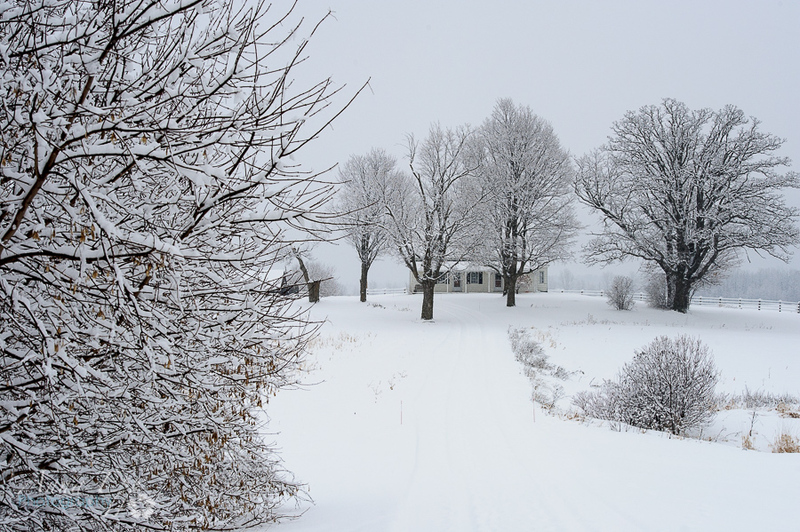 I also fell in love with our Farmhouse during the winter months. You would think that living in a 130+ year old home that winter would be cold and drafty. Well, some parts are, but mostly it is just beautiful. Every morning we have gorgeous sunrises over the fields and every night the sun sets over the forest across the road. Some days, with enough snow, we can’t even get out our driveway. But when a gorgeous dumping of snow arrives like this morning and coats the trees and house with snow, it is just gorgeous. And the silence of it all is magical, reminds us of why we decided to move our family out of suburbia to the country, even if it is only ten minutes away. Forget the winter blues, put on your best gear and take it outside. Fall in love with winter again. 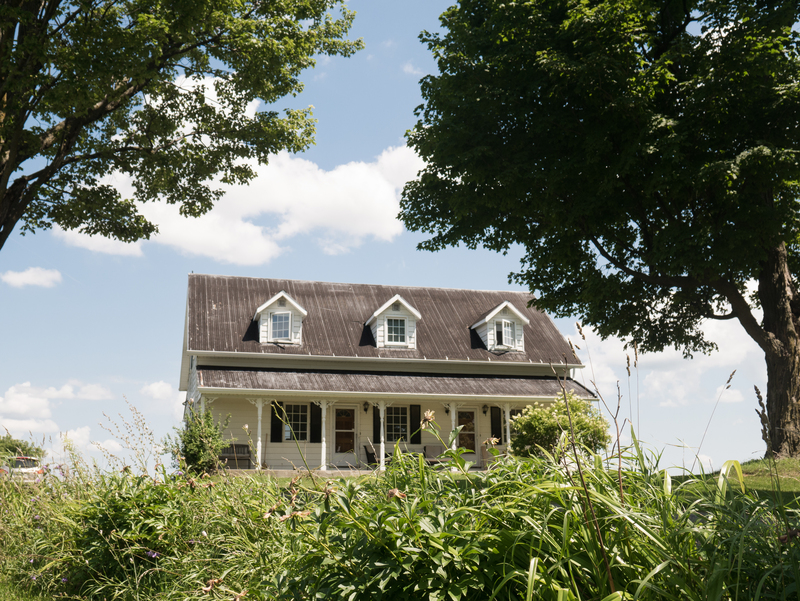 Find a magical place, like the farmhouse, to go and hang out.